Imagine having a head full of story ideas and plotlines but never being able to get them down before you lose them. How frustrating would that be? That was the case for my kids—as it is with many other budding writers—for many years. They are full of great ideas, but their ability to write them down does not develop at the same speed as their ability to generate them. There used to be a lot of drama in our house when they would start story after story and give up after the first couple of paragraphs. “My hand got too tired,” was the common response when I inquired about the unfinished state of their masterpieces. I would scribe for them whenever possible, but as they got older and more children came into our family, my ability to do that for everyone diminished. Although we had not allowed our kids to use computers or other devices for the first several years of their lives, it occurred to me that if they could learn to type well, their fingers might stand a chance at keeping up with their brains. So, hesitantly, we decided to try typing lessons a few years ago. We received a subscription to a paid typing program through the school we’re registered with, and I set both girls up with an account. Now, I should mention that I loved learning to type. (Weird, I know). I took a mandatory typing class in grade nine and it was one of my favourite classes. Perhaps that is because it was taught by one of my favourite teachers, whose assignments included playing SimCity, coding a computer game, and creating a simple website using HTML, but honestly, I really did enjoy the typing lessons too. I still remember the challenge of trying to get a faster score on each new set of words. So, of course, I thought my kids would love the lessons too. I guess that was naive of me. This was, after all, their first time using a computer. Maybe I should have started with something a little more stimulating, but these lessons hit the floor with the dull thud you would expect when introducing little girls to something they have no interest in. Although my girls now use the computer to write stories daily, their typing skills are still lacking. 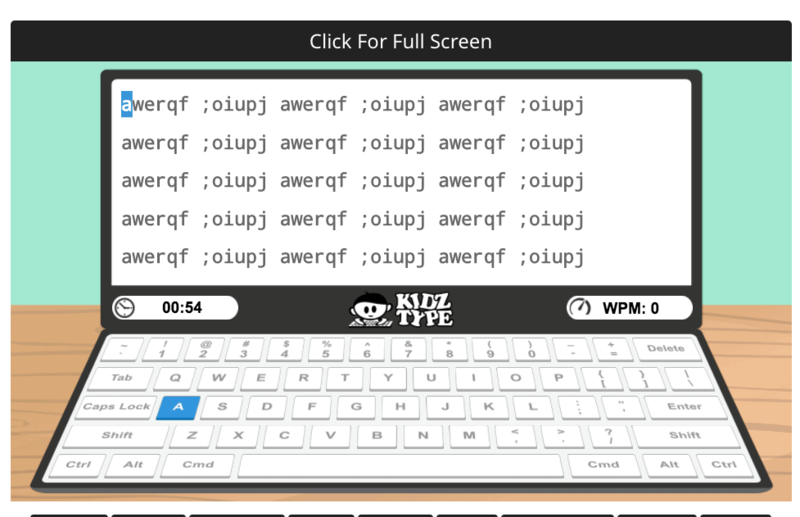 When I learned about KidzType, a kid-friendly website with free online typing games and lessons, my hopes of hearing the clickety-clack of small hands flying over the keys were revived. Maybe this time would be different. I introduced them to KidzType, which thankfully requires absolutely zero setup time, and asked them to test it out and record their progress. 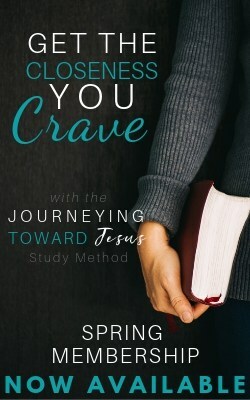 The following is an overview of our experience. I was compensated for my time reviewing KidzType. All opinions are my own. 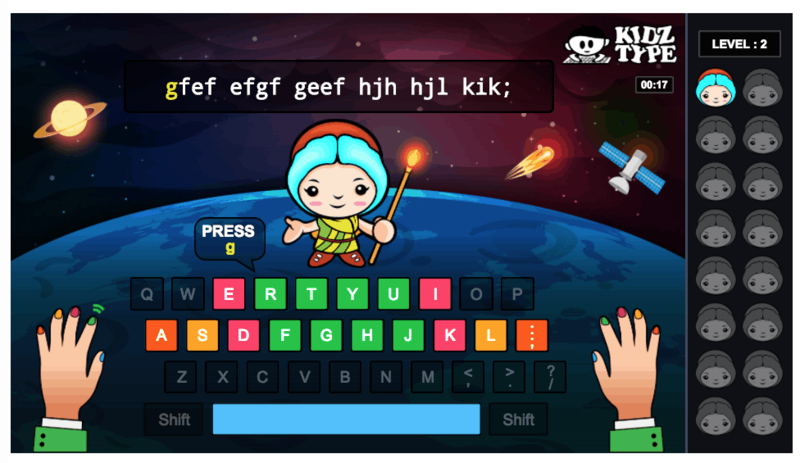 The KidzType website has four categories of activities: typing games, typing lessons, typing exercises, and typing practices. All areas of the website are free to use and do not require an account. The first game you’ll see on the KidzType homepage is Dance Mat Typing. This interactive game teaches incrementally more challenging typing skills over the course of 12 stages. A brightly coloured keyboard fills the screen with each key colour corresponding to a particular finger. Kids type a given row of text and each button and finger lights up on the screen to prompt the next letters, encouraging kids to use the screen as their guide instead of looking down. The first lesson introduces the home row and each subsequent lesson introduces new letters and punctuation keys. There are sixteen more free typing games on the Typing Games tab. Each has a different theme, such as racing cars, racing cats, racing bulls, and popping balloons. While some are easier than others—Typing Balloons requires one letter at at time, whereas Bull Spell at the grade 8 level has you racing to type words like syncopate and extravagant—all of the typing games are designed to give rigorous typing practice and get fingers moving quickly and accurately. I dare you to not get completely ensconced yourself in a game of Bull Spell. The Typing Lessons page offers activities that will be familiar to anyone who studied typing in high school. Here you do concentrated practice on a few letters at a time for periods of one, two, or three minutes. These are great for drilling the locations of each letter, but are not quite as fun as the typing games. The Typing Exercises and Typing Practices pages are similar in format to the Typing Lessons page, but here the letters are combined in more challenging series of repeated patterns, presenting a logical progression from the typing lessons. If you want to get a baseline idea of where your kids (or you!) 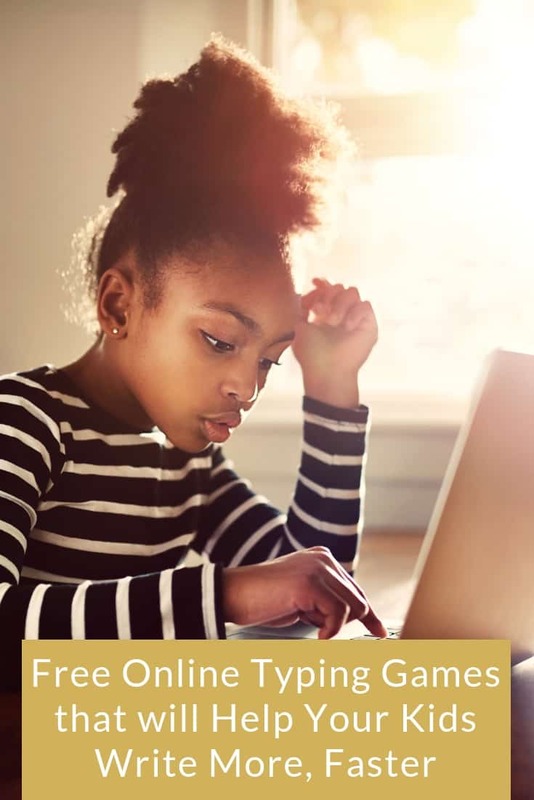 are at with their typing before beginning lessons, KidzType also has a sister site called TypeDojo.com that offers free typing speed tests. You can take a one, three, or five minutes test. If your kids are motivated by certificates, TypeDojo offers certificates after the test is complete. My girls tested out KidzType’s games and lessons for a week and really enjoyed it. Within a week, their speed showed an improvement of 8-12 words per minute to 21-23 words per minute. I didn’t give them any specific parameters about how to use the site. I allowed them free access to it and allowed them to play as many games or complete as many lessons as they wanted. They’re still asking me if they can go on it, so I guess it’s a hit. If you wanted to try something more structured, you might set apart 15 minutes a few times a week and ask them to complete one lesson and one exercise for each game they play. Honestly, I think they will see benefits even if they only play the games, but the biggest improvements to their speed, accuracy, and memorization will likely come from the exercises and practices. 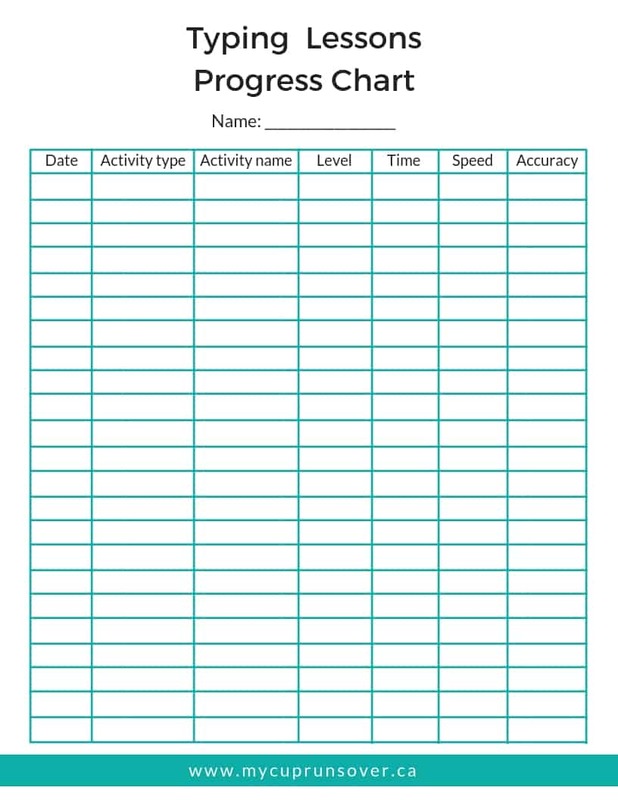 You can use the free printable typing practice progress report below to keep track of their rapidly expanding typing prowess. Despite the move toward an increasingly paperless society, I still think two traditional skills are key: printing and transcribing. That's why, in addition to typing practice, my girls are still required to write their stories down on paper from time to time and then transcribe them onto the computer. This further improves their typing skills while also ensuring that they don't rely solely on a word processor. Their stories continue to flow out of them, and now that they're typing a bit better, they're almost able to keep up with the flow of ideas. 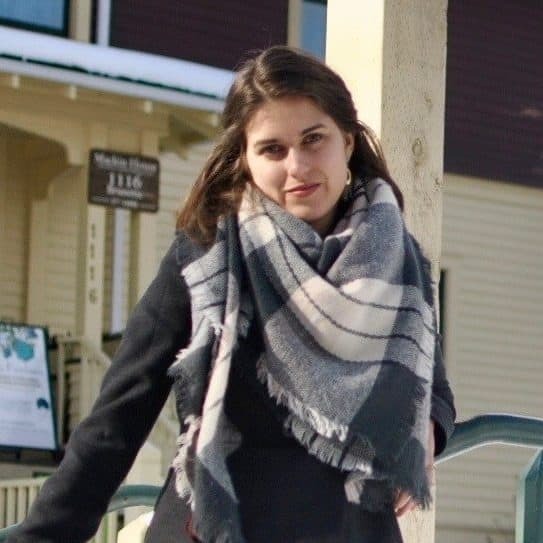 If your kids need some help applying the skills they develop with KidzType to real world writing scenarios, download and print my 100 Writing Prompts for Middle and High School Students. They'll be typing up a storm in no time.